Dedicated readers who’ve been following my site since the beginning know that without a doubt, I’m a girl who’s all about effortless elegance. And like all things timeless, elegance is something that will never go out of style. An easy way to achieve an elegant look? Take your shirt and tuck it in to your skirt. It helps, of course, if you’ve got a skirt with a high waist and shapely structure. Case in point? Easily achievable, effortless elegance is possible by tucking in a blouse, tee, or camisole to any one of these grosgrain-waisted skirts. J. Mendel Metallic Hand-Pleated Skirt: This gold metallic skirt features some flashy details that are topped off with a black banded grosgrain waist. This J. Mendel design would look absolutely darling for a dressed-up occasion. The cascade ruffle on the front extends all the way from the waist to the hem, and really adds extra shape to the voluptuous bubble styling. $1350, Bergdorfs. Giambattista Vallie Cashmere and Wool-Blend Skirt: From the Fall 2010 RTW, this camel-coloured skirt is a must-have for any working woman. The grosgrain ribbon waist is divine, and it works to complement two front pleats and a slight A-line shape. The wool/cashmere blend is heavy, and the ribbon waist adds an airiness to the skirt. $1295, Net-A-Porter. J.Crew Super 120s Tulip Mini: In a fantastic four-season-friendly material, I favourite this J.Crew mini skirt in heather flannel. The grey colouring really makes the Japanese grosgrain waistband stand out. The asymmetrical draping is all the detailing this mini needs to make it stand out. As the editors at J.Crew say, this piece is your perfect “desk-to-dinner” answer. $138, J.Crew. See? It’s as easy as that. Find a grosgrain-waisted skirt that suits your fancy, whether it’s mini or more modest in length, and pair it with a simple shirt. Add some signature sky-high heels or boots, and you’ll be set. You can work it with tights for winter, and bare legs in summer. Your options are endless! I am absolutely loving Ralph Lauren’s Addington leather skirt. Some women have a misconception that leather can’t – or shouldn’t – be worn during the day and at the office, but I beg to differ. This leather skirt is completely classy. Like every piece by Ralph Lauren, with this leather skirt you’re investing in a timeless skirt that will definitely become a go-to item in your closet. Check the straight cut, the flattering back-shaping darks, the flat welt pockets, and defined waistline. HOT. I’d style it monochromatic with a body-hugging black turtleneck, or go classic chic with a crisp white shirt. And I’d always ALWAYS wear it with heels. Hope’s ThisNext Picks: ShopBop Sale! And ALL things that are worth a closer look. I’m especially loving the few jackets marked down by one of my favourite designers, Diane von Furstenberg. Check out these and my other picks at ThisNext.com. It’s a fact: Post-August temperatures taper off and dip below leg-baring levels if you live anywhere that’s not sunny So-Cal, but that’s no excuse for not owning — and sporting — at least one mini skirt this season. How convenient for you that I should choose three favourites to feature. Pair with tights and sky-high platforms or well-heeled boots for the most long-legged effect. 1. Thakoon — A sweet and unique take on the mini, Thakoon’s feather-seamed skirt is cold-wind ready with a strong and thick jacquard print. Besides the fabulous feather-inspired pattern, this mini also boasts feather-shaped satin piping. 2. Derek Lam — First, he’s a genius. Second, this skirt is so costume-y, and I LOVE IT. For real. Who ever knew that felt — not silk, not satin — could be so super glam, what with its fantastical tiers, banded waist, and tonal topstitching? 3. JCrew — Though I’ve never been a prep-school, Birkenstock-wearing kind of girl, lately JCrew has impressed me by branching out into more wearable — non-college — fashions. This cashmere-infused, patch-pocket mini sits low on the waist and has a slight A-line shape to hide any fuller-figure mishaps. And it’s affordable. Go figure. 3. It boasts pretty, flattering pleats and a topstitched waistband (for that extra dainty detail). As someone who swears by the luxe quality of Moschino’s eyewear, I can’t help but feel that the quality carries over into the clothing. Sure Cheap & Chic is the name of the line, but don’t let the ‘cheap’ part fool you. Franco Moschino’s vision stays alive with this boat neck shift dress (with convenient invisible pockets on either hip.) 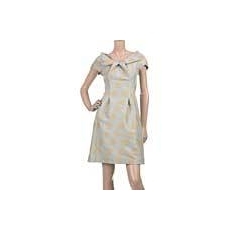 The dress is classic, the pattern is mod, for a mix that is true to you. Pair with black tights and some skyscraper heels-platforms-wedges, and you’re set.